So you don’t want Visual Studio to be installed in a Virtual Machine, because that’s not what happens in the real-world. You want Visual Studio to be natively on your Windows 8, but easily copy files for deployment to IIS/SharePoint site hosted by your 3-tier virtual machines of Web-App-Database servers. 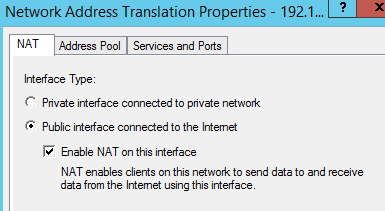 You want to be able to use the Domain Controller’s DNS in the virtual machine, so you can type http://intranet.zed.com from Windows 8 Internet Explorer, not from Restricted IE inside your virtual machine. You want to simulate having 2 Datacenters, where 2 virtual machines have different Subnet, and they all communicate through a Software Router. Even better, the Software Router connects to your Windows 8 Internet so all the virtual machines can get Internet access via the router without configuring 2 network cards. This post will be a long one, with a lot of screenshots, but it’s a necessary one. This is the table that I used for my SQL Server Disaster Recovery talk. I have 2 datacenters and simulating what happens when servers in one country go down. 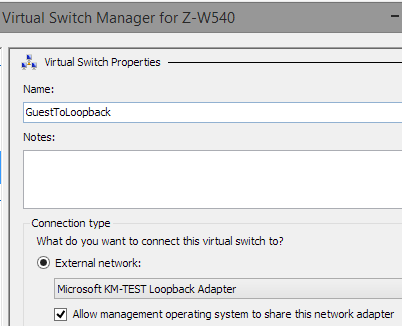 The Loopback Adapter will allow our host Windows 8 to browse the IIS/SharePoint hosted in the virtual machines. 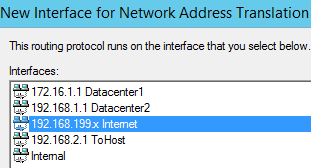 It will also query the DNS of the Domain Controller hosted in the VM. Go to Control Panel > Device Manager. Right-click your computer name (the first top node under device manager) and select Add Legacy Hardware. Choose Advanced, Manually select from list (Advanced), scroll down to choose Network Adapters then click Next. 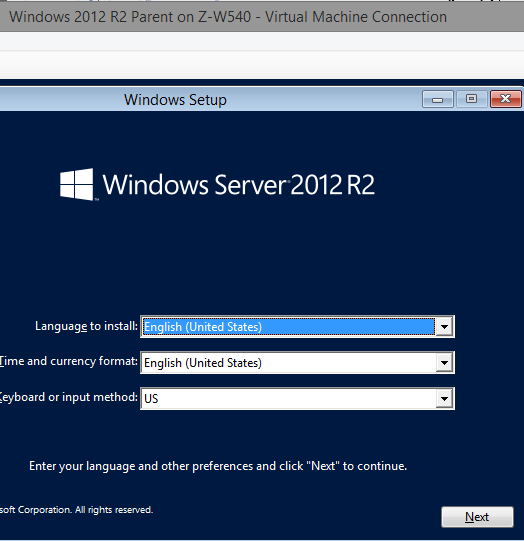 Go to Hyper-V Manager and open Virtual Switch Manager. 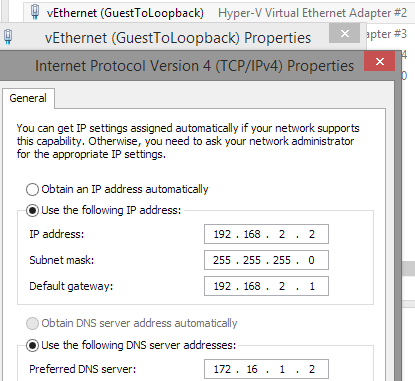 Create a new External Virtual Switch and name it GuestToLoopback, configuring it to the physical Loopback adapter as shown below. Create another new External Virtual Switch and name it GuestToWiFi, configuring it to the physical Wireless adapter that you have connected to Internet. You should now have 4 Switches configured in your Hyper-V Virtual Switch Manager: 2 are private to simulate 2 datacenters, 1 is for host-to-vm and another for allowing the VMs to get Internet. 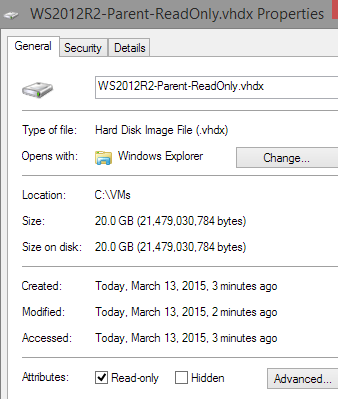 # ZeddyLabs.com - CreateParentDisk.ps1 # Create a Parent Disk to be used for Differencing purposes later Import-Module Hyper-V New-VHD -Path "C:\VMs\WS2012R2-Parent.vhdx" -Dynamic -BlockSizeBytes 2MB -LogicalSectorSizeBytes 4096 -PhysicalSectorSizeBytes 4096 -SizeBytes 20GB New-VM -BootDevice CD -Generation 2 -MemoryStartupBytes 2GB -Name "Windows 2012 R2 Parent" -Path "C:\VMs\WS2012R2-Parent" -VHDPath "C:\VMs\WS2012R2-Parent.vhdx"
New-VM -BootDevice CD -Generation 2 -MemoryStartupBytes 2GB -Name "Windows 2012 R2 Parent" -Path "C:\VMs\WS2012R2-Parent" -VHDPath "C:\VMs\WS2012R2-Parent.vhdx"
Now Start the VM “Windows 2012 R2 Parent” and install the OS. Save the BGInfo settings as “DefaultBGInfo.bgi” so you can load this on every Child Virtual Machine later on. When you want to join a virtual machine to the domain setup in Domain Controller, you need unique SIDs. This is why you have to SysPrep the Parent before creating the child disks. This will ensure that the Parent Disk cannot be modified and that changes will occur in the Child Disks later. # ZeddyLabs.com - CreateChildDisks.ps1 # Creates Child Disks using the WS2012-R2-ParentDisk-ReadOnly as Parent # DC1 = Domain Controller 1 # SQL1 = SQL on Datacenter1 (Abu Dhabi) # SQL2 = SQL on Datacenter2 (Singapore # SP1 = SharePoint on Datacenter1 (Abu Dhabi) # SP2 = SharePoint on Datacenter2 (Singapore) # ROUTER1 = Router connecting Datacenter1 to Datacenter2 Import-Module Hyper-V New-VHD -ParentPath "C:\VMs\WS2012R2-Parent-ReadOnly.vhdx" -Path "D:\VMs\DC1\DC1.vhdx" -Differencing New-VM -BootDevice VHD -Generation 2 -MemoryStartupBytes 1.5GB -Name "DC1" -Path "D:\VMs\" -VHDPath "D:\VMs\DC1\DC1.vhdx" -SwitchName "Datacenter1 on 172.16.x.x" New-VHD -ParentPath "C:\VMs\WS2012R2-Parent-ReadOnly.vhdx" -Path "D:\VMs\ROUTER1\ROUTER1.vhdx" -Differencing New-VM -BootDevice VHD -Generation 2 -MemoryStartupBytes 1GB -Name "ROUTER1" -Path "D:\VMs\" -VHDPath "D:\VMs\ROUTER1\ROUTER1.vhdx" -SwitchName "Datacenter1 on 172.16.x.x" Add-VMNetworkAdapter -VMName "ROUTER1" -SwitchName "Datacenter2 on 192.168.x.x" Add-VMNetworkAdapter -VMName "ROUTER1" -SwitchName "GuestToLoopback" New-VHD -ParentPath "C:\VMs\WS2012R2-Parent-ReadOnly.vhdx" -Path "D:\VMs\SQL1\SQL1.vhdx" -Differencing New-VM -BootDevice VHD -Generation 2 -MemoryStartupBytes 2.5GB -Name "SQL1" -Path "D:\VMs\" -VHDPath "D:\VMs\SQL1\SQL1.vhdx" -SwitchName "Datacenter1 on 172.16.x.x" New-VHD -ParentPath "C:\VMs\WS2012R2-Parent-ReadOnly.vhdx" -Path "D:\VMs\SQL2\SQL2.vhdx" -Differencing New-VM -BootDevice VHD -Generation 2 -MemoryStartupBytes 2.5GB -Name "SQL2" -Path "D:\VMs\" -VHDPath "D:\VMs\SQL2\SQL2.vhdx" -SwitchName "Datacenter2 on 192.168.x.x" New-VHD -ParentPath "C:\VMs\WS2012R2-Parent-ReadOnly.vhdx" -Path "D:\VMs\SP1\SP1.vhdx" -Differencing New-VM -BootDevice VHD -Generation 2 -MemoryStartupBytes 6GB -Name "SP1" -Path "D:\VMs\" -VHDPath "D:\VMs\SP1\SP1.vhdx" -SwitchName "Datacenter1 on 172.16.x.x" New-VHD -ParentPath "C:\VMs\WS2012R2-Parent-ReadOnly.vhdx" -Path "D:\VMs\SP2\SP2.vhdx" -Differencing New-VM -BootDevice VHD -Generation 2 -MemoryStartupBytes 6GB -Name "SP2" -Path "D:\VMs\" -VHDPath "D:\VMs\SP2\SP2.vhdx" -SwitchName "Datacenter2 on 192.168.x.x"
New-VM -BootDevice VHD -Generation 2 -MemoryStartupBytes 1.5GB -Name "DC1" -Path "D:\VMs\" -VHDPath "D:\VMs\DC1\DC1.vhdx" -SwitchName "Datacenter1 on 172.16.x.x"
New-VM -BootDevice VHD -Generation 2 -MemoryStartupBytes 1GB -Name "ROUTER1" -Path "D:\VMs\" -VHDPath "D:\VMs\ROUTER1\ROUTER1.vhdx" -SwitchName "Datacenter1 on 172.16.x.x"
Add-VMNetworkAdapter -VMName "ROUTER1" -SwitchName "Datacenter2 on 192.168.x.x"
Add-VMNetworkAdapter -VMName "ROUTER1" -SwitchName "GuestToLoopback"
New-VM -BootDevice VHD -Generation 2 -MemoryStartupBytes 2.5GB -Name "SQL1" -Path "D:\VMs\" -VHDPath "D:\VMs\SQL1\SQL1.vhdx" -SwitchName "Datacenter1 on 172.16.x.x"
New-VM -BootDevice VHD -Generation 2 -MemoryStartupBytes 2.5GB -Name "SQL2" -Path "D:\VMs\" -VHDPath "D:\VMs\SQL2\SQL2.vhdx" -SwitchName "Datacenter2 on 192.168.x.x"
New-VM -BootDevice VHD -Generation 2 -MemoryStartupBytes 6GB -Name "SP1" -Path "D:\VMs\" -VHDPath "D:\VMs\SP1\SP1.vhdx" -SwitchName "Datacenter1 on 172.16.x.x"
New-VM -BootDevice VHD -Generation 2 -MemoryStartupBytes 6GB -Name "SP2" -Path "D:\VMs\" -VHDPath "D:\VMs\SP2\SP2.vhdx" -SwitchName "Datacenter2 on 192.168.x.x"
Now we need to configure NAT so that other virtual machines connected to this router have Internet access. 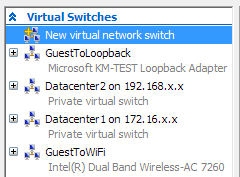 Select the virtual ethernet that is connected to Internet (your WiFi or LAN cable). 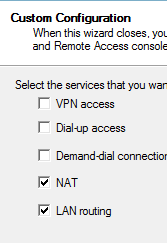 Finally choose Public interface connected to the Internet and select Enable NAT on this interface. Now you are done setting up the Router Software. With ROUTER1 VM still running, Start DC1 VM, then configure the static IP address according to IP Table in Part 0 above. Rename the Computer Name to DC1 and restart VM. 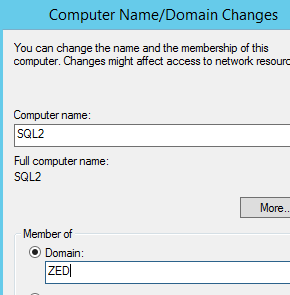 Add Role Active Directory Domain Services. Add a new Forest ZED.com and click Next Next Next until server is promoted as DC. You now have a Domain Controller up and running! 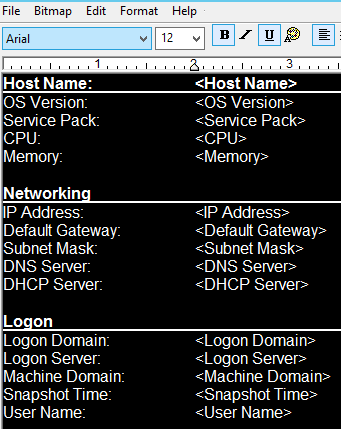 Keep ROUTER1 and DC1 virtual machines running, then login to other VM and configure their static IP Addresses according to IP Table in Part 0 above. In order to do this, I need to turn off my WiFi. Just click your Wireless icon down there and select Wi-Fi Off. Now open up CMD prompt and type “nslookup DC1.zed.com” , it should connect to your Loopback adapter which connects to ROUTER1 that connects you to DC1 virtual machine. This entry was posted in Technical and tagged developer, Windows 8 by zeddy. Bookmark the permalink. ZeddyLabs is licensed under a Creative Commons Attribution-NonCommercial-ShareAlike 3.0 Unported License.